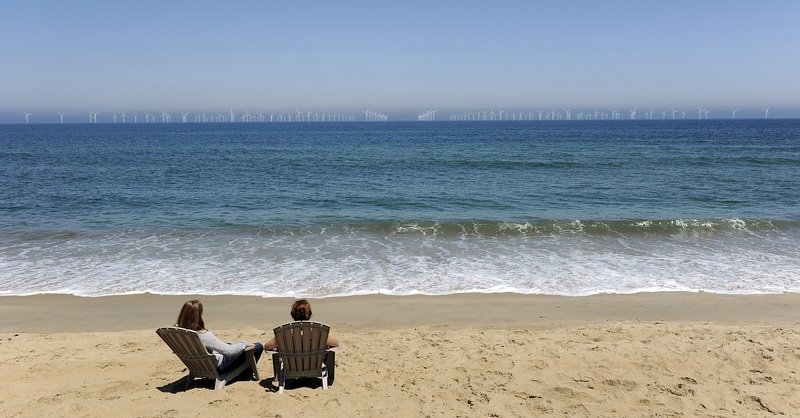 New study shows near-shore wind farms are likely to negatively impact coastal tourism. The U.S. is among the global leaders in installed wind energy capacity, but as a new study by CEnREP researchers highlights, offshore wind resources have not yet been harnessed in the U.S.
A frequently noted impediment to offshore wind development is the vocal concern by coastal communities that offshore wind farms will alter ocean views. CEnREP Director, Laura Taylor, and coauthors Sanja Lutzeyer and Dan Phaneuf, wanted to explore this question and understand how a utility-scale offshore wind farm could impact coastal tourism. In particular, the researchers were interested in how families who rent vacation properties along North Carolina beaches would react to a utility-scale wind farm placed at the beach by their rental. To find out, Taylor and coauthors surveyed people who had just rented a vacation property along the N.C. coast. As part of the survey, respondents were asked whether or not they would re-rent their vacation property if the view over the ocean included wind turbines. Respondents were shown digitally altered photos that included either 64, 100 or 144 turbines placed 5, 8, 12, or 18 miles out to sea (see below for examples). A positive story that emerges from the standpoint of wind energy development is that twenty percent of respondents said they would be willing to rent a home at the same location, without any change in price, if turbines were further than 8 miles from shore. “In this case, even though some renters may leave the market, new ones with preferences like this group should fill their places, leaving rents unchanged overall,” said Taylor. However, if 144 turbines are placed 5 miles from shore, this same group would require about a five percent discount in price to come back and rent a vacation house. Sample images from the survey are presented below. The images were taken off the Town of Nags Head, NC and digitally altered to include 144 wind turbines. CEnREP Alumnus Wins Presidential Award!